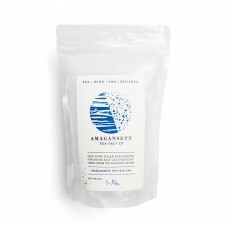 Our same, great 100% Pure Amagansett Sea Salt in a re-sealable plastic pouch. Use our salt as a finishing salt and dress your foods sparingly - two to five crystals per bite is enough. Our salt is moderately coarse-grained and surprisingly “sweet” to give a pleasing, soft crunch and the perfect flavor. This is the same pure finishing salt and in the same (albeit slightly smaller) pouch we supply to restaurants across the US - see our Our Partners page for a partial list. Cook and feel like a pro!